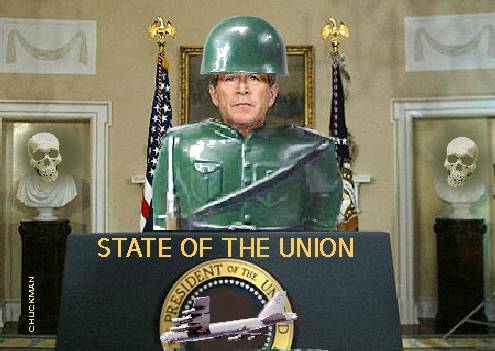 No doubt about it, the State of the Union was Bush’s lamest performance to date. He may have lunged to the dais like a prizefighter, soaking in the adulation of the Republican faithful, but when the bell rang he made a few wheezing sounds before nose-diving to the canvas. Off his game, was he? The soliloquy was familiar enough: Bush promising to take the broad-ax to popular domestic programs so that more revenue could be loosened up for high-tech weaponry and exorbitant tax cuts. But the delivery was as flat as Texas road kill. It had none of the gusto of his earlier speeches, just the monotone whimpering of a political understudy reciting his lines to the teleprompter. His droopy performance made no difference to the euphoric Congress. They were quick to their feet at every opportunity; bellowing their approval for Bush’s grand plan. What complete twaddle. Maybe he’s planning to turn water into wine as well, or part the Red Sea. Imagine this nonsense coming from a president who increased overall government spending by 25% while cutting revenues to an unsustainable level. But, as we all know, facts have no bearing on the disciples on George the Baptist. Their etherealized world-view emerges from a solid devotion to Bible, moral values and mumbo-jumbo. “Frivolous asbestos claims! ?” Ah, yes, those pesky, trivial cancer claims. Whatever made us believe that a citizen could sue for damages for something as trifling as premature death? Thankfully, Mr. Bush’s keen sense of moral rectitude has put us back on the path of righteousness. We should be ever so grateful. What lunacy? Less dependent?! Didn’t we just spend $300 billion invading Iraq? What was that all about? The irony was lost on the doting Congress who rose in a tsunami of praise; their hoots and hollers resounding through the rotunda. The cameras scanned the exuberant audience, honing in on the bulbous, florid visages of overfed vulgarians cheering away at their political frat party. Sometimes, it’s hard to believe that there’s an unbroken chain of succession from Jefferson and Adams to this dismal cast of pedestrians. Bush’s speech took a turn for the worse when he started into his 30-minute oratory on Social Security. It was a fatal mistake. This conspicuous deception was followed by a lengthy, mind-numbing diatribe that left even the most ardent Bush loyalist wincing in agony. The Commander-in-Chief morphed into a shabby pitchman for Wall Street; hawking stock plans to his captive audience like a traveling medicine man. It was grim; much like watching a comedian flailing and fading in front of a packed house. It went on forever. Despite the reverential atmosphere, there was a fair amount of jeering when the straight-faced Bush unleashed this corker: “The United States has no right, no desire and no intention to impose our form of government on anyone else;” a remark that left many either laughing or gasping for air. For some reason, Bush’s speechwriters invariably insert a few meaningless tidbits about the desperate situation in the Middle East. The reasoning seems to be that if we discuss it openly then the public will forget that the US is underwriting the carnage with boatloads of money and weaponry. The Deceiver-in-Chief is in way over his head on the Israeli-Palestinian conflict. He’s already reneged on his former promise of a Palestinian homeland in 2005, and has subsequently (unilaterally) overturned UN Security Council Resolution 242 by approving of Sharon’s settlements in the West Bank. Now, he adds to the insult by offering $350 million to rebuild the PA security infrastructure that Sharon has been destroying for the last 4 years. The proposal is nothing more than a slap in the face to the many innocent people who needlessly suffered or died while Bush did nothing. Interestingly, Bush exhorted both Saudi Arabia and Egypt to “show the way toward democracy in the Middle East.” It would serve him right if they took him up on that. Consider the damage Saudi Arabia could inflict on American markets if the people had greater control over the pricing of their greatest resource? Think what havoc Egypt might cause to Israel if a representative Islamic government replaced Mubarak? Bush’s spurious comments are purely theatrical and shouldn’t be taken seriously. Bush assumed his warrior demeanor to tackle the Iran crisis. Undoubtedly, many people across the globe were looking for a clue to grasp the direction of the administration. Most of Bush’s commentary is flagrantly false. The IAEA (after lengthy investigations) has found no evidence of a nuclear weapons program. Iran has no plutonium and it has stopped its uranium enrichment program even though it is legally permitted to pursue it under the provisions of the NPT (Nuclear Proliferation Treaty) He also conceals that the US has deployed covert operatives onto sovereign Iranian territory, and has authorized illegal intrusions into Iranian airspace; a clear provocation of hostilities. Bush’s lies will be carefully analyzed by friend and foe alike. It’s likely that they will notice the resemblance they bear to the fabrications produced prior to the war in Iraq. This should alert the world that they should stop the pointless effort to disprove that Iran has a nuclear weapons program and, instead, get on with the more pressing task of providing conventional weaponry for Iran’s defense in the event of an American attack. Bush offered nothing new about the Iraqi nightmare except to reiterate the resolve of American elites to continue the colonial project ad infinitum: “We will not set an artificial timetable for leaving Iraq…We are in Iraq to achieve a result” etc, etc, etc. The four permanent military bases and the $1.5 billion US embassy (the largest in the world; large enough to facilitate the entire Middle East if you catch my meaning) attest to the fact that American servicemen will be dying in Babylon for the foreseeable future. Bush’s presidency is now inextricably yoked to the policies of aggression and subjugation. He has already cemented a legacy of torture and war crimes. Whatever glimmer of hope that people derive from his public ruminations to Congress is of little consequence. The real State of the Union is one of desperation; a nation increasingly alienated from its allies, from its principles and from its moral underpinnings. If the man at the top was anything more than vacuous poseur, he would have told us just that.